Two weeks in and it has already been an unforgettable November with Donald Trump being named the President Elect. Host to Veteran’s Day and Thanksgiving, November is often the kickoff of the holiday season. For caregivers, the busy-ness of November doesn’t stop there though. In fact, November is host to National Family Caregivers Month, National Home Care and Hospice Month and National Long Term Care Month. As you may have guessed, caregivers and caregiving hold a special place in our heart, so in the next few weeks we will be blogging on the history and importance of each of these Nationwide celebrations and awareness campaigns starting with National Family Caregivers Month. To raise awareness of and thank Family Caregivers, on Oct. 31 of this year, President Obama made the official proclamation of November being National Family Caregivers month. Per statistics, more than 65 million Americans provide care for a friend or loved one. On top of normal responsibilities and jobs, this care consumes on average an additional 20 hours per week. As you can imagine, this added responsibility puts a strain on finances. In fact, family caregivers are 2.5 times more likely to live in poverty and 5 times more likely to receive supplemental security income. Furthermore, the Center for Disease Control reports that over 35% of caregivers find it difficult to find time for themselves and 29% of caregivers have trouble balancing physical and emotional stress. In addition, the prolonged stress of caregiving has caused nearly 23% of caregivers to report poor health for at least 5 years after taking care of a loved one. The statistics don’t lie. 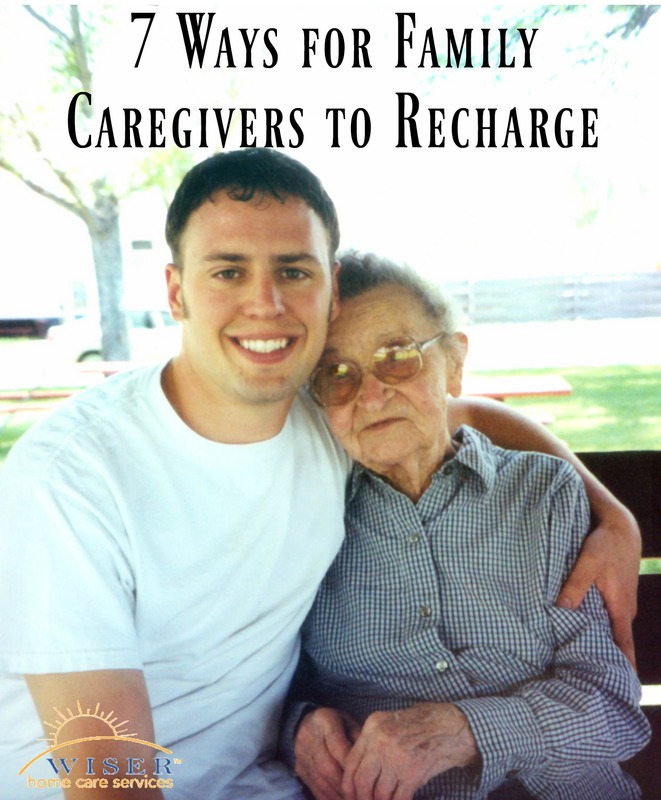 There is nothing easy about caregiving. It is often a long, difficult journey but the reward of taking care of our loved ones is why we do it. That is why raising awareness and support for Family Caregivers is so important. The theme for this year’s National Family Caregivers month is “Take Care to Give Care,” because, to be effective caregivers, we must first take care of ourselves. To help you take care of yourself, we have compiled a list of 7 self-care tips you can do to prevent caregiver burnout and provide your loved one with the best care. From doctor’s appointments to cooking, cleaning and physical care, caring for a loved one is undoubtedly extremely stressful. Making sure you are managing your stress in a healthy manner will help you take better care of your loved one. Exercise, sleep, quiet time, soothing music and breathing exercises are all great ways to reduce stress. When caring for a loved one it is natural to put all your effort in their care. In fact, many family caregivers get burned out because they operate under the false assumption that caring for themselves would be selfish. It couldn’t be further from the truth. Having some “you-time” is another way you can ensure that you are replenished enough to care for your loved one. Remember: you can’t pour from an empty cup. Many family caregivers also have part- or full-time jobs to help pay the bills at home or for the loved one. It is important to stay up with your own work so that you don’t risk losing your job. If finances do become an issue, there are several assistance services available to help shoulder the load. Maintaining outside friendships is important to keeping your sanity as a caregiver. Maybe have a set friend date once a week or every other week. Having someone to vent to and share your stress with will go a long way in increasing the quality of your care. Read a funny blog, go see a movie or go out to do something. Make sure you are taking time every day to do something fun to break up the monotony of being a family caregiver. We all have our limits, when we go beyond them is when we are asking for trouble. Don’t feel ashamed to ask for help whenever you need it. In the end of the day, if you ask for help, it will be better for both you and your loved one. Whether you need a couple hours out of the house or a full night of sleep, our Respite Care Service will be there for you so that you can recharge. Our respite care services give you a chance to leave home knowing that your loved one is with a professional, well-trained caregiver. Setting up respite care is easy, it can be a few hours a week to run errands, or 24-hour care so you can take a vacation or go on a business trip. Please do not hesitate to contact us. We will be happy to help you set up a comprehensive care plan for your loved one and answer any questions you may have.